Speaker Nigerian house of representatives Yakubu Dogara met with the Pope today in Rome. after the meeting with Pope Francis He says the Catholic head has been praying for the peace and stability of Nigeria. Dogara quoted the pope as saying this when he met with the head of the Catholic Church at Saint Peters Square, Vatican City. 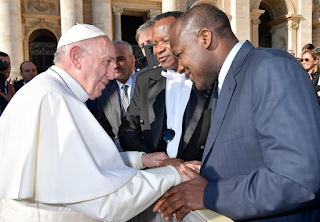 Dogara, who described the meeting with Pope Francis as “awesome”, said he surprised and delighted to know that the pontiff was well informed about the happenings in Nigeria. ”The moment I was introduced to him as the Speaker of the Nigerian Parliament, he said, “how is Nigeria and how are you working for the peace of Nigeria?" Pope Francis then told the Speaker that he always prays for the peace of Nigeria saying, “I pray for the peace of Nigeria and pray for me also,” he was quoted as saying. The Speaker was accompanied by the Nigerian Ambassador to the Vatican, George Umo, who disclosed that the Pope had held mass in honour of the 26 Nigerian girls that died in the Mediterranean sea while trying to enter Italy few weeks ago.